Some people believe that this coconut palm is the symbol of romance in the tropics. People associate the coconut palm with relaxation and shade looking out over the sea to the horizon similar tall trees grow to be 50-80 feet. There are many varieties of coconut trees. The smallest is called the Dwarf palm. The coconut grows in rainforests and other tropical of climates. The coconut fruit has a hard outside and white meat beneath with a hollow center in which there is coconut milk. After the clusters of flowers bloom they develop into coconuts. It may take a year or so for the coconut tree to mature. One tree can produce 50 nuts. Men harvest the coconuts by climbing the tree and cutting down the bunch of coconuts. The coconut palm tree grows in hot areas. It likes frost free areas, and grows in Africa, Asia, Latin America, and the Pacific region. The tree grows near seas in these areas so the roots can find moisture. In the United States it is found only in Hawaii, the Southern tip of Florida, Puerto Rico, and the Virgin Islands. Coconuts have supplied some families from the Pacific with shelter, food, drinks, and many of their other needs. The roots supplies' a dye and the trunks are used to stabilize buildings. The hard outside is cut into slices of wood called Porcupine. The white meat of the coconut is eaten. They get coconut cream by sifting the white meat till it turns soft and creamy. They use the liquid for a nice refreshing drink. The sap from unopened clusters of flowers is used to make sugar, vinegar, and the alcoholic beverages. 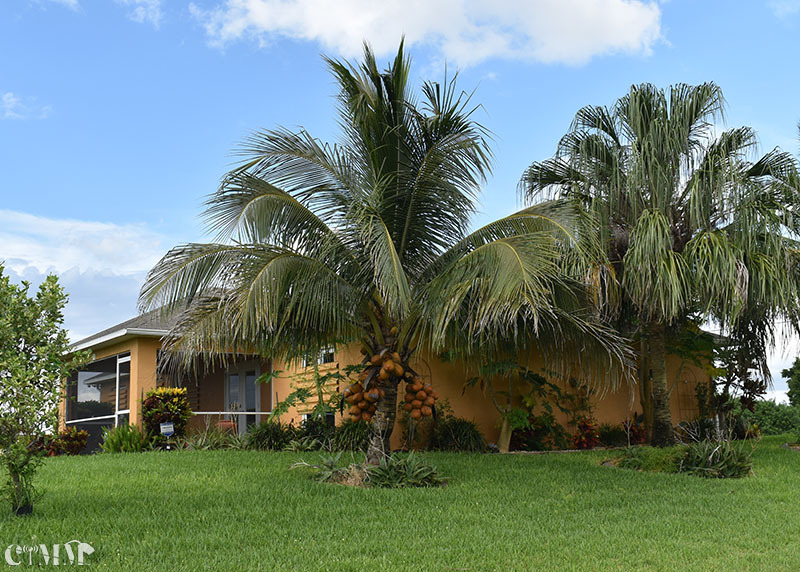 The coconut palm likes to live in fall sun and frost free areas. It likes water but it has to be well drained areas. It has shallow roots.